A strong start to the trading week, fueled by solid quarterly earnings results, was not enough to lift the S&P 500 higher for the week. Investors were spooked on Friday by Turkey’s falling currency, placing the Turkish economy in near crisis state. Rising political tensions between the U.S. and Turkey provided the backdrop for Friday’s move as Turkey’s detainment of a U.S. pastor prompted the U.S. to respond with economic sanctions. Those sanctions have sparked a confidence spiral that the Trump administration seized upon Friday morning by announcing the U.S. would now impose 50% tariffs on steel and 20% tariffs on aluminum from Turkey. These tariffs were announced as the U.S. remains embroiled in a trade war with China. This week, China announced it would impose a 25% tariff on $16 billion worth of U.S. goods in response to the U.S.’ tariffs of the same magnitude on Chinese goods, which are set to go into effect August 23rd. Thus far, both countries seem prepared to dig in for an extended trade fight, but Chinese data this week revealed that, thus far, the tariffs have done little to dent demand for its exports. As for the U.S., it was a relatively light week for economic news, with the most important metrics being the producer and consumer measures of inflation. The inflation numbers indicate that while higher prices may not have impacted the overall volume of goods being pulled through the economy, prices are definitely firming. The broad market measures could simply not hold up to the late week concerns, with the S&P 500 finishing down slightly by -0.36%. Chinese exports continued to rise despite the Trump administration’s recently implemented tariffs. In July, Chinese exports rose 12.20% year-over-year (yoy), up from June’s 11.20% yoy increase. One of the counterproductive side effects of the tariffs is that it has strengthened the dollar relative to the Chinese yuan. With a stronger dollar, U.S. consumers are able to purchase more Chinese goods which partially negates and softens the net impact of the tariff. Meanwhile within China, strong domestic demand for coal, crude, and iron lead to a 27.3% yoy surge in imports. That was up sharply from June’s 14.00% annual increase. The much-watched surplus with the U.S. fell slightly to $28.09 billion in July from a record $28.97 billion the previous month. This was likely influenced by the same currency dynamics discussed above, but in reverse. So far, the tariffs appear to be having only a minor impact given that Chinese exports are up sharply and there was little change in the U.S.-China surplus. Unfortunately, the failure by either side to draw blood only means that the stakes are likely to grow higher with no end in sight. China has committed to matching the U.S. dollar for dollar on the size and scope of any tariffs, with each country announcing new 25% tariffs on $16 billion of one another’s goods over the last two weeks. Producer prices were unchanged in July for the first time in seven months as an increase in the cost of goods was offset by a decline in services. Despite no change in July, prices are still 3.30% higher from a year ago. Higher oil prices, combined with strong demand from U.S. consumers and businesses, have served to push the index higher over the past year, with the new tariffs now muddying the picture in determining if these accelerating prices are simply self-imposed or a larger demand/supply imbalance. Although headline inflation has only moved modestly upward in the past year, traders have been paying close attention to intermediate demand prices. Intermediate demand prices, or the cost charged for goods and services sold to businesses as inputs in production, have posted a sharp rise. Prices for processed goods for intermediate demand rose 6.80% in July from the year ago period, while prices of unprocessed goods rose 8.20%. Rising prices for intermediate goods suggest cost pressures are building in the production pipeline which may force producers to pass along more of those costs to consumers, but it also suggests the acceleration is more tariff related, meaning the Fed may be more dovish than it would if it were truly excess demand driven. Core consumer prices, which exclude volatile food and energy, jumped an annualized 2.40% in July, the largest annual increase since September 2008. Meanwhile, headline inflation rose 2.90% in July, matching June’s increase. Excluding volatile food and energy, transportation services, the cost of living, and medical care services all posted strong yoy increases. Transportation services prices rose 4.00% from the year ago period as the nationwide trucker shortage forced transportation firms to pass along costs to consumers. Consumers were also hit by rising prices for shelter and medical care services, up 3.50% and 2.30%, respectively. The rise in consumer prices is definitely something worth watching because the probability is that it is purely demand driven at this point. With the tariff impact starting to show in producer input costs, the two fuels are starting to mix and could be explosive. What had been a sleepy week for markets was jolted by late week geopolitical concerns. Ties between the US and Turkey have become increasingly frayed as of late, and confidence among investors finally broke. Fortunately, the financial fallout from Turkey is fairly contained – this is no Greece 2009. At the time of the Greek crisis, Greece was a bit player from a global GDP perspective, but Europe’s banks had a big exposure to Greek debt. Turkey’s debt is roughly a third of Greece’s at the time, and since the Great Recession both the global economy and its financial banking system are on significantly firmer ground. While the Turkish crisis is likely to play out for a while, the longer-term impact is likely to be less economically significant than it will be politically given Turkey’s strategic importance with respect to Russia and the Middle East. It will soon be back-to-school for the kids. Next week we’ll get our first read on the back-to-school shopping season as retailers report on retail sales. Housing will also be on deck as housing starts for August are released. In overseas news, the European Union reports on international trade. Our advisors tell clients that estate planning is about much more than wills and trusts. It is also about preserving and understanding the life of a person, in part through his or her possessions. If you are fortunate to have surviving parents or grandparents, it’s important to hear the stories and memories that go along with the possessions they have collected over their lifetime, and to do this now so that you won’t have to guess later about what is valuable — emotionally and financially. Richard Eisenberg of Next Avenue recently interviewed the author of a new book on the topic of how to ensure our life stories live on after we have passed. The author, Laura H. Gilbert, is a retired policy analyst and professor with a Ph.D. who has written four books about college and how to pay for it. She wrote her latest book, The Stories We Leave Behind: A Legacy-Based Approach to Dealing with Our Stuff, to address concerns that fellow boomers as well as Gen X’ers and millennials have about what will happen to all their personal stuff when they pass away, as well as what to do with the “tsunami of stuff” that can be overwhelming to families when a loved one dies. The book is incredibly timely. Mary Kay Buysse, executive director for the National Association of Senior Move Managers, states that “For the first time in the history of the world, two generations are downsizing simultaneously,” referring to the boomers’ parents (sometimes, the final downsizing) and the boomers themselves who are in their 50s, 60s, and 70s who may be downsizing. Gilbert argues that today’s generations don’t have a need for — or a place to put — entire households full of stuff they may inherit from parents or grandparents and are unprepared to make decisions about the mounds of possessions acquired over a lifetime and the emotional connections that go along with them. Furthermore, many of us don’t want to leave the psychological and physical burden of boxes upon boxes of stuff after we pass away, nor do we want our loved ones to overlook items of emotional or financial value. To tackle this challenge, Gilbert tells individuals to ask themselves, if I only have three to five themes in my life, what do I want them to be? She advises people to contemplate how they want to be remembered, what stories tell that legacy, and what stuff highlights those stories. This approach can help all of us pare down our possessions to what is most meaningful and reflective of the legacy we want to leave behind, and to reduce, donate, or sell items that are no longer relevant to us. The ideal scenario is for individuals to make these decisions about their life and their possessions and for families to have these discussions in advance, but if it’s not possible, Gilbert advises to put a post it note on the back of anything meaningful or valuable to you and write a note or memory on it so loved ones can preserve our stories. According to the author, this approach can alleviate a lot of the heaviness, grief, and guilt loved ones may feel regarding dealing with stuff after someone has passed. It also allows us to preserve the best stories among our own belongings and minimize final decisions and cleanup for our families. Sources: Richard Eisenberg (2018, August). Boomers: Feeling overwhelmed by your stuff? Try this approach. Marketwatch. Retrieved from https://www.marketwatch.com/story/heres-a-new-approach-to-dealing-with-all-of-your-stuff-2018-08-08?mod=hp_minor_pos21; Laura H. Gilbert (2018). 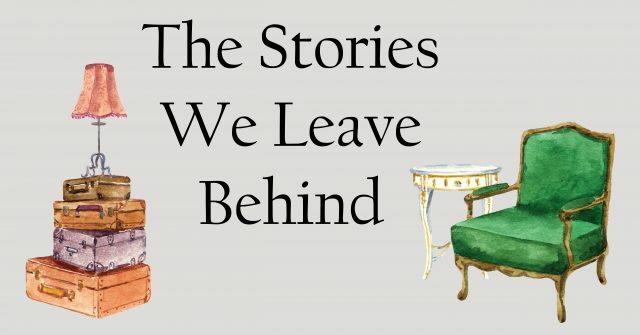 The Stories We Leave Behind: A Legacy-Based Approach to Dealing with Stuff. United States. CreateSpace.